TOKYO – Asian stocks slumped to 3-year lows on Monday as a slump in Chinese equities gathered pace, hastening an exodus from riskier assets as fears of a China-led global economic slowdown churned world markets. A 2.6 percent fall in S&P 500 mini futures to a 10-month trough during Asian trading hours suggested the falls could continue later in the global session. Safe-haven government bonds and the yen rallied on the widespread unrest in the financial markets, set in motion nearly two weeks ago when China sharply devalued the yuan and stoked concerns about the state of its economy. “Markets are panicking. Things are starting look like the Asian financial crisis in the late 1990s. Speculators are selling assets that seem the most vulnerable,” said Takako Masai, the head of research at Shinsei Bank in Tokyo. Copper, seen as a barometer of global demand, tumbled to six-year lows as the anxiety over China sapped investor confidence. Bourses from Japan to Indonesia were hit hard as Chinese stocks plummeted from the open on Monday, with investors failing to take heart from the formalisation of rules over the weekend – allowing pension funds to invest in the stock market. “The market is in a downtrend. There’s no good news, stocks are still expensive, and there’s no fresh money coming in,” said Qi Yifeng, analyst at consultancy CEBM. MSCI’s broadest index of Asia-Pacific shares outside Japan duly sank over 4.6 percent to a three-year low. 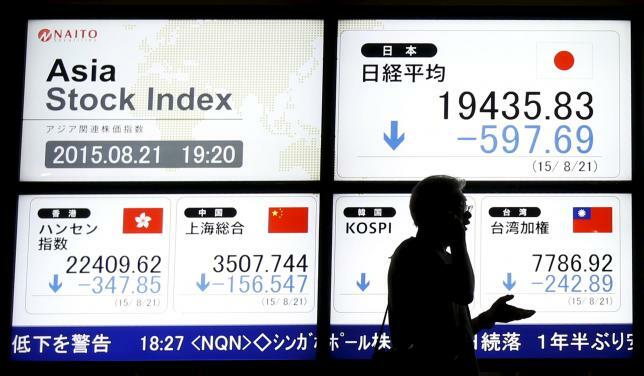 Tokyo’s Nikkei was down 4 percent and Australian shares retreated to a two-year trough. “China could be forced to devalue the yuan even more, should its economy falter, and the equity markets are dealing with the prospect of a weaker yuan amplifying the negative impact from a sluggish Chinese economy,” said Eiji Kinouchi, chief technical analyst at Daiwa Securities in Tokyo. Emerging market economies, many reliant on exporting raw materials, have been hit particularly hard by the spectre of slower Chinese growth and sliding commodities. South Africa’s rand struggled at 14-year lows. The Turkish lira, its plight exacerbated by domestic political developments, languished near a record low. The Malaysian ringgit hit a 17-year low. For some, the speed of their currency’s fall appeared to have prompted an intervention. South Korean authorities were suspected of selling dollars to arrest the won’s fall. Although its decline was not as grave, the dollar also suffered against key peers such as the euro and yen as global growth worries undermined wagers that the Fed will raise rates in September. The dollar was down 0.8 percent at 121.00 yen after hitting a six-week low of 120.73. The euro soared to a 6-1/2 month high of $1.1496. The U.S. currency came under additional pressure as Treasury yields extended their decline on safety buying alongside the slide in equities. The benchmark 10-year Treasury note yield touched a four-month low below 2 percent. U.S. crude was down 2.6 percent at $39.39 a barrel while Brent lost 2.1 percent to $44.52 a barrel.